For residents, search in the physical activity sector is hard. Finding available activities based on distance, time or activity is often the biggest stumbling block when it comes to being more physically active. For public bodies, huge investment goes into physical activity infrastructure such as leisure sites, parks and open spaces, but without a good way for residents to access the information about these activities and facilities, it is hard to make the biggest impact possible. 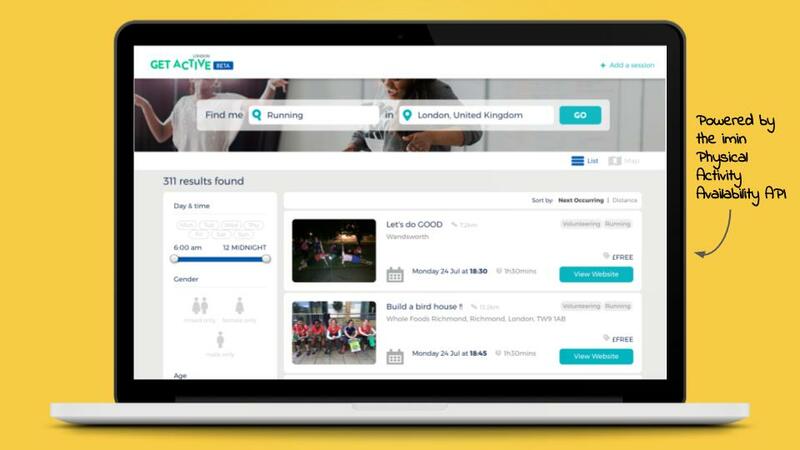 Get Active is a whitelabel activity finder, available via the web, powered by open opportunity data via the imin platform. For residents, Get Active is a simple to use search tool that can show available activities by activity type, location, day, start time, and gender / age / disability suitability. The information is accurate and up to date as it is open opportunity data published directly from providers. Get Active is a whitelabel / re-skinnable activity finder, powered by open opportunity data via the imin platform, developed in collaboration with CSPs and a team of developers and user experience experts. The result is an evolving tool designed to showcase open data in all its glory to your residents. Soon, working in collaboration with imin, consumer users of Get Active will also be able to book and pay for physical activities without leaving the website - a revolutionary new user experience for the sector, and creates opportunities to capture participation data for consumers booking via Get Active. Get Active will finally be the tool that most local authorities have been dreaming of: an activity finder for residents to find, book and pay for any physical activity across the region. It is available for organisations to use for their region or target user group, at a monthly software-as-a-service cost (and will include a cost associated with access to the imin platform as part of the package). Get Active is already plugged in the imin platform, so once you’ve chosen your domain name and a few customisable elements, it is very quick to deploy and start using! We’re looking to work with any organisation to that looking for a purpose built, consumer facing product that will help them tap into the benefits of the growing volume of open opportunity data available across the country. In particular, Get Active is well suited for organisations that want to start opening up more opportunity data in their region, and need the first example of a consumer facing website where that data will flow to in order to explain the concept to providers and encourage them through the process. Get Active uses open opportunity data as supplied by the imin platform. Potential to create participation data and user accounts once booking and payment features are available. Get Active will finally be the tool that most local authorities have been dreaming of: an activity finder for residents to find, book and pay for any physical activity across the region. All powered by open data.